Top (5th) floor 2 split bedroom/2 bath condo. Living room and dining room L, eat-in kitchen, laundry room and large patio with comfortable seating. Light and bright, this unit is beautifully furnished and fully equipped. View of lake and tennis courts. Complex has two Pools and Jacuzzi with a new Fitness Gym. Cable TV and high speed internet with new Flat Screen TV and soundsystem. Great tennis community with 24 har-tru courts, 2 swimming pools and Jacuzzi plus a club pool located on the property that offers swim lessons and water aerobics. Just a little more than a mile to Delray's award winning beaches. Many nearby golf courses to choose from. Delray is a beautiful, quaint 'Village by the Sea' offering many wonderful restaurants, art galleries, theatre, live music and shopping to please everyone. Located just 20 minutes south of Palm Beach Intl. Airport and 25 minutes north of Ft. Lauderdale Intl. Airport and one hour to Miami International Airport. We have enjoyed staying at this condo for the past three winters. It has a great location , water views, is clean and nicely equipped with many amenities to be comfortable upon arrival. The owner is very responsive to anything that needs being taken care of and delightful to work with. We enjoyed the Racquet Club's easy access to meeting people who play tennis, biking nearby A1A, the beach, pool, hot tub and super friendly people. We would definitely recommend this property. 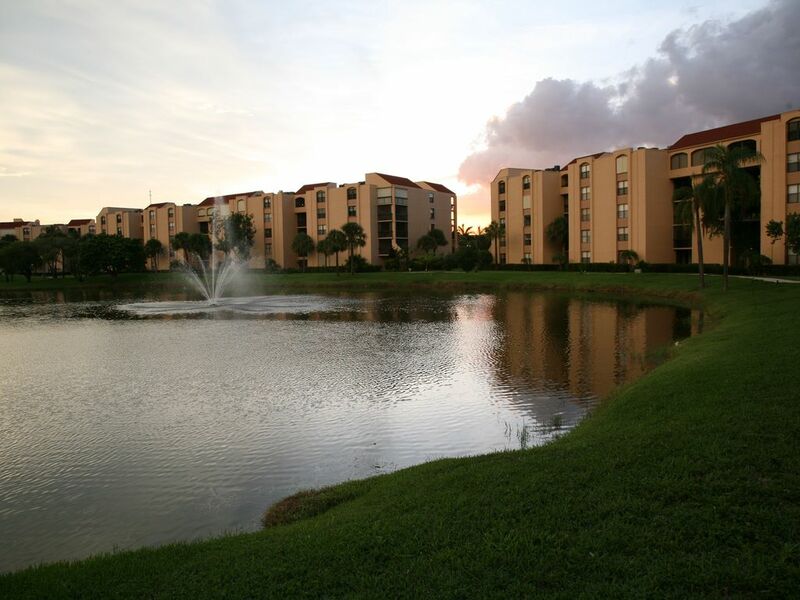 Delray Racquet Club condominiums are set around a pond and 24 Har-Tru tennis courts, along with two pools, a hot tub and fitness room. (1 month minimum rental period) There is a mandatory background check and application process that needs to be done with our HOA office prior to booking. Please do not book online until this process has been completed.